Senate recalls suspended Ndume – Royal Times of Nigeria. 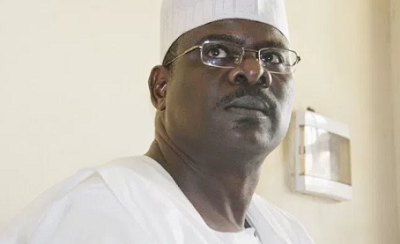 The Senate has finally recalled its former Majority Leader, Ali Ndume, who was suspended ìn controversial circumstances eight months ago. It could be recalled that the Borno APC senator was placed on suspension following the recommendation of the ethics and privileges committee of the Senate headed by Chris Anyanwu. The committee was asked to investigate allegations against Bukola Saraki, the President of the Senate, and Dino Melaye. Although Mr. Ndume was not the originator of the allegations, on March 20, he raised a point of order asking the Senate to investigative issues involving the two lawmakers, as reported in the media. At the conclusion of its assignment, the Anyanwu committee accused Mr. Ndume of raising a false alarm capable of tarnishing the image of his colleagues. He was subsequently placed on six months suspension. However in September, when the six months was deemed to have passed, the Senate issued a statement extending the suspension to November, on the excuse of discounting holidays and weekends. A Federal High Court last week nullified the suspension, saying it was illegal. The court also ordered Mr. Ndume’s immediate reinstatement and payment of all his entitlements for the period of the suspension. However, the Senate through its counsel, Mike Ozekhome, said on Sunday that it would appeal the ruling. In a letter addressed to Mr. Ndume by the Clerk to the Senate, Nelson Ayewoh, he was asked to resume in plenary on Wednesday (tomorrow). The clerk wrote, “The suspension notice of the Senate vide Resolution S/Res/130/02/17 expires on November 14th, 2017. “This communication is to inform the Distinguished Senator of your resumption in plenary scheduled for Wednesday, 15th November, 2017,”. The letter dated November 6 came four days before the Federal High Court in Abuja nullified Mr. Ndume’s suspension.